Referring to a large UK based public sector organisation running a shared service centre offering IT resources, the intention is to give an overview of financial management’s relationship with an organisation and its 3rd party suppliers. 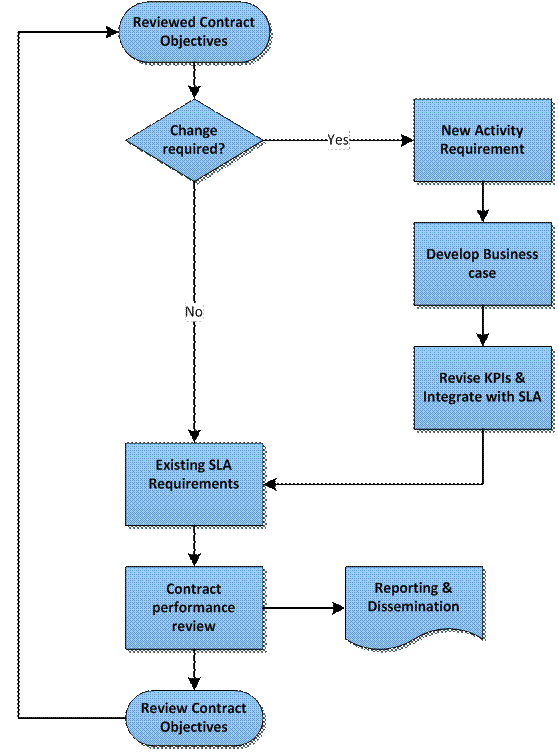 For new activities within the existing Service Level Agreement (SLA) framework, early involvement the financial management function in developing business cases, including consultations the client departments and project management is essential to understand requirements. This helps with the preparation of cost benefit analyses and quantifying risks. Discussions with 3rd party suppliers and project managers allow for a thorough breakdown of costs and performance, as well as payment milestones before proposals are signed off. The review and maintenance of the accounting reporting system to provide consolidated reports for existing one-off projects and service lines is needed to monitor financial performance on a monthly basis. This included monthly, year to date and annual actual activity compared to budget, as well as contract life cycle reporting. Significant variances are investigated, both internally and with the 3rd party supplier to take action. An issue Log and risk register are maintained and discussed regularly with interested parties with reference to ownership and escalation levels. Purchase-orders are setup in line with payment milestones involving the procurement function and budget holders. Regular meetings to review progress reports with suppliers and project management are scheduled and cash-flow forecasting is maintained to monitor cash levels ensuring cash is available to meet payment deadlines. Advice is provided on transfer pricing by referring to the SLA framework in ascertaining unit costs for the products and services. Processes need to be in place to integrate the financial performance of the shared service corporately to ensure effective consolidation. Regular reports are made to the steering committees and project boards on financial performance, updating them on any outstanding issues and progress on new activities. Through regular communication with the corporate centre particularly the central finance function, information is disseminated on issues such as corporate efficiency, returns on investment (ROI) and Value-add targets which support decision-making and ensures goal congruency. This type of analysis helps identify potential joint venture opportunities both internal and external. Maintaining strong relationships with suppliers is an important way to keep up to date with emerging technological and social changes which can be assessed in the organisation’s business models for action. Advice can be then reported corporately through the business planning process to secure funding and rank them against competing proposals. Fact finding – Information gathering about the existing system through process documentation review, structured interviews with relevant stakeholders and other performance information currently available. Identifying shortcomings – An analysis of these finding is used to develop a clear picture of relationships and outputs will include process documentation, flowcharts and most importantly, a gap analysis between the existing system and aspirations of the stakeholders. Development and implementation of solutions – Proposals to close the gap are considered and agreed with stakeholders before implementation to meet predefined quality levels and milestones. Review – Periodic reviews are done at least annually to assess the effectiveness of the changes. For comments or further information please complete the contact form below.